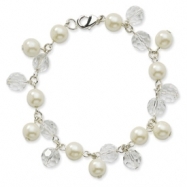 Whether you are looking for a delicate and elegant pearl bracelet for your wedding day, or you are looking for something that will add a splash of color and style to your everyday wardrobe, we have the pearl bracelet for you. 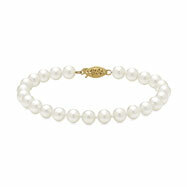 We are pleased to present our quality pearl bracelets in classic and modern styles. 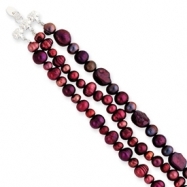 You will find a rainbow of colors among our Freshwater Pearl bracelets, a fashionable selection of Akoya Pearl bracelets, Mother of Pearl bracelets for that special occasion, and even Black Tahitian Pearl bracelets. 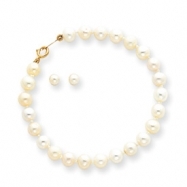 We guarantee that your pearl bracelet will be of the finest quality and luster, so take a moment and browse through our extensive selection. 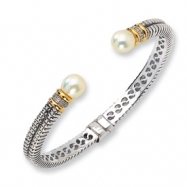 14k Baby Cultured Pearl Set - 5.5" Bracelet & Screwback Earrings""
7.5" 14kt White Gold 8-99mm "A" Quality Natural Color Tahitian Cultured Pearl Bracelet. 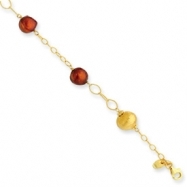 "A" quality - lower luster, moderate blemishes, near to off round, & good matching. 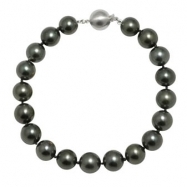 7.5" 14kt White Gold 9-10mm "A" Quality Natural Color Tahitian Cultured Pearl Bracelet. "A" quality - lower luster, moderate blemishes, near to off round, & good matching. 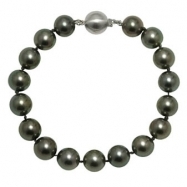 7.5" 14kt White Gold 8-9mm "A+" Quality Natural Color Tahitian Cultured Pearl Bracelet. "A+" quality - slightly spotted, good luster, near round, & good matching. 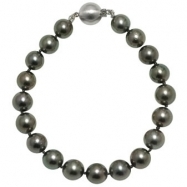 7.5" 14kt White Gold 9-10mm "A+" Quality Natural Color Tahitian Cultured Pearl Bracelet. "A+" quality - slightly spotted, good luster, near round, & good matching. 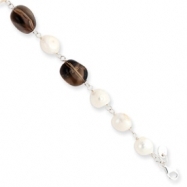 7.5" 14kt White Gold 8-9mm "AA" Quality Natural Color Tahitian Cultured Pearl Bracelet. 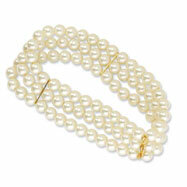 "AA" quality - clean, high luster, near round, & excellent matching. 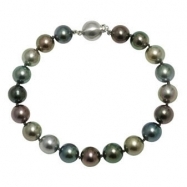 7.5" 14kt White Gold 9-10mm "AA" Quality Natural Color Tahitian Cultured Pearl Bracelet. 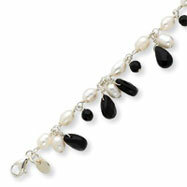 "AA" quality - clean, high luster, near round, & excellent matching. 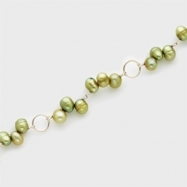 7.5" 14kt White Gold 8-9mm "AB" Quality Natural Color Tahitian Cultured Pearl Bracelet. 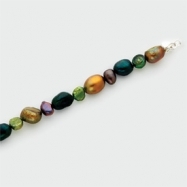 "AB" quality - medium - lower luster, off to near round, heavy spotting, & fair matching. 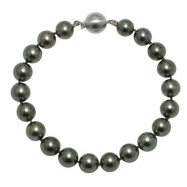 7.5" 14kt White Gold 9-10mm "AB" Quality Natural Color Tahitian Cultured Pearl Bracelet. 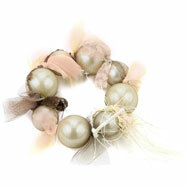 "AB" quality - medium - low luster, off to near round, heavy spotting, & fair matching. 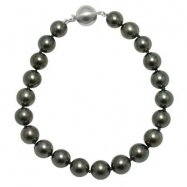 8" 14kt White Gold 8-9mm "A" Quality Natural Color Tahitian Cultured Pearl Bracelet. 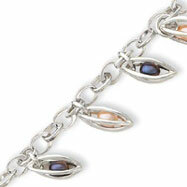 "A" quality - lower luster, moderate blemishes, near to off round, & good matching. 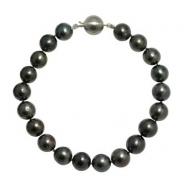 8" 14kt White Gold 8-9mm "A+" Quality Natural Color Tahitian Cultured Pearl Bracelet. "A+" quality - slightly spotted, good luster, near round, & good matching. 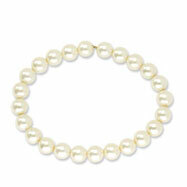 8" 14kt White Gold 9-10mm "A+" Quality Natural Color Tahitian Cultured Pearl Bracelet. "A+" quality - slightly spotted, good luster, near round, & good matching. 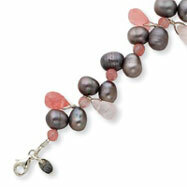 8" 14kt White Gold 8-9mm "AA" Quality Natural Color Tahitian Cultured Pearl Bracelet. 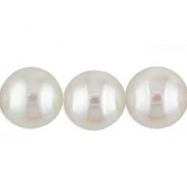 "AA" quality - clean high luster, near round, & excellent matching. 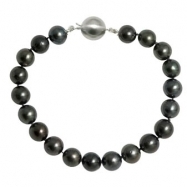 8" 14kt White Gold 9-11.5mm "AA" Quality Natural Color Tahitian Cultured Pearl Bracelet. 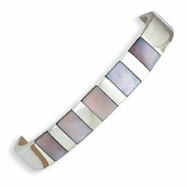 "AA" quality - clean, high luster, near round, & excellent matching. 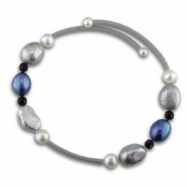 8" 14kt White Gold 8-9mm "AB" Quality Natural Color Tahitian Cultured Pearl Bracelet. 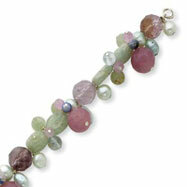 "AB" quality - medium - lower luster, off to near round, heavy spotting, & fair matching. 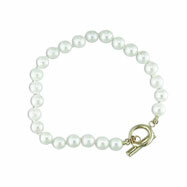 8" 14kt White Gold 9-10mm "AB" Quality Natural Color Tahitian Cultured Pearl Bracelet. "AB" quality - medium - low luster, off to near round, heavy spotting, & fair matching. 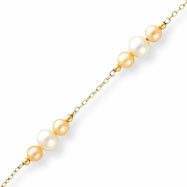 7.5" 6-6.5mm Akoya cultured pearl bracelet with 14kt toggle clasp. 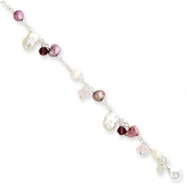 Silver-tone Cultura Glass Pearl & Crystal Multi-drop 7.25" Bracelet""